Place shredded paper in your garbage. This is because recycling facilities are designed for items larger than confetti sized pieces. Larger pieces of paper are recyclable, but shredded paper will fall through the rollers on the recycling machinery and become trash. Instead of shredding an entire document, shred only the parts that contain private information. 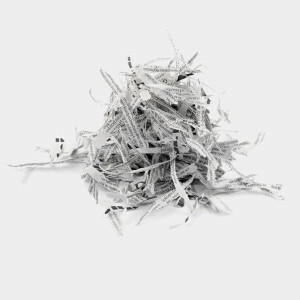 If protected info is removed and shredded, the rest of the document can be recycled. You might also consider an ID Blocking Ink Roller that blocks out personal information, then put in the recycle bin. The DocuTeam offers secure, confidential, on-site document shredding. Call with questions.